Zygapophysial joints, also called facet joints or apophyseal joints, are the unsung heroes of the spinal anatomy. These small, but vital structures connect each vertebral bone to the one above and below it, creating a unified and strong spinal column from what would otherwise be just a line of individual vertebral components. 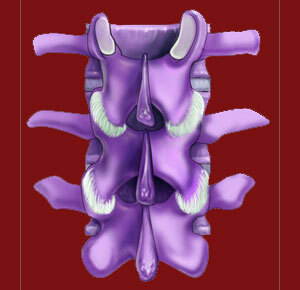 The zygapophyseal structures are the site of age-related changes that typically occur throughout the spinal anatomy. When these changes become pathological instead of normal, the condition is called facet joint syndrome. The mission of this website is to educate patients about the facts of the facet joints, including how and why facet joint pain occurs. Just as importantly, we provide an objective view of these anatomical tissues and explain why so many cases of facet syndrome are misdiagnosed as the actual origin of suffering. This background essay contains some factual data concerning the apophyseal joints that most back and neck patients do not know. If you have been labeled with any facet joint-related diagnosis, then this article will provide critical food for thought about the real nature of your pain. The facet joints are synovial joint types that contain a protective capsule of ligaments and fluid that help to regulate and facilitate smooth and effortless range of motion. Each facet joint is made up of the overlapping articular processes of neighboring vertebral bones. These bones meet within the joint capsule and are protected from interacting directly by the lubricating fluid of the joint, as well as by the protective cartilage that covers the bony surfaces of the articular processes. Facet joints have different angles of contact, depending on where they exist in the spinal anatomy. They also demonstrate different ranges of motion, depending on the spinal zone where they reside. Facet joints in the lumbar spine and cervical spine are called upon to provide greater mobility between vertebrae and therefore will suffer exacerbated wear and tear due to all this motion-related activity. Meanwhile, facet joints in the thoracic spine do not provide the same degree of motion from one vertebra to another and are thus spared much of the age and activity-related structural breakdown suffered by the neck and lower back. It must be clearly annotated that it is normal for the facet joints to age and to degenerate due to completely expected life processes. Facet degeneration is not inherently painful or problematic. The articular processes of each vertebra are like small tabs that lock together with the corresponding tab on the neighboring vertebra. These processes are bound together by soft tissues and strictly regulated in their degree and direction of movement. The two sides of the joint are usually protected from damaging interactions between bony surfaces by the synovial fluid and the insulating cartilage of the joint. Their mechanism allows the zygapophysial joints to hold the vertebral bones together with a very durable bond, but also facilitates movement between the 2 bones to provide ample flexibility for the human backbone. The ligaments that hold the joint together and regulate the range of joint motion are very strong and provide structural stability to the joint through its entire span of movement. Facet joints also contain small nerves that innervate the joint and help it to function in response to anatomical needs. As the spine ages, the intervertebral discs desiccate and lose mass. This causes the discs to shrink and the vertebral bones to move closer to one another. This change of proximity slightly changes the efficiency of the facet joint functionality, as well as providing more volatile joint interactions between the joined articular processes. As the articular processes begin to interact, the spinal arthritic processes ensue, not only at the facet structures, but also on the surfaces of the vertebral bodies and at other spinal joint locations. Bony surfaces interact more frequently and with more effect, generating friction and wearing away the protective measures of the joints. The synovial fluid will decrease in volume and possibly dry up almost completely. The protective cartilage will wear away and might become inflamed in some cases as it does so. Now the bony surfaces of the joint are interacting directly, which causes the growth of osteophytes and accumulations of arthritic debris within the joint structure, as well as on the edges and exterior of the joint. These osteophytes are the classic signs of arthritis and are usually not symptomatic at all, or at least not to a significant degree. However, in some cases, these spurs can form in areas of frequent joint interaction, making the joint dysfunctional from a mechanical viewpoint. This can be very painful and is the most commonly cited reason for facet joint syndrome. Other times, the small nerves within the joint might become compressed by this arthritic spurring and might also create facet syndrome symptoms. If osteophytes grow outward from the joint, or if the entire facet structure becomes hypertrophic, which is relatively common, the posterior border of the neuroforaminal space can become closed off. When other contributory factors align, this can create a pinched spinal nerve root and a variety of pathological symptoms. As a final thought, the ligaments that regulate the zygapophysial joints, and keep them bound correctly, can also suffer injury and degeneration. These ligaments can become hypertrophic, can ossify, or can otherwise become overly taut or lax. Any of these scenarios can be painful, or otherwise symptomatic, and might even instigate spinal instability locally in the joint or regionally in an entire area of the backbone.